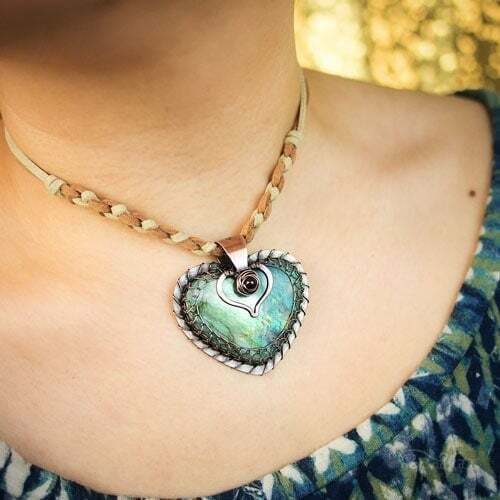 Do you crave a personal connection with your jewelry? I’ve got just the thing for you. Personalized heart necklaces for the romantic at heart. Expertly made for you to inspire your creative soul. 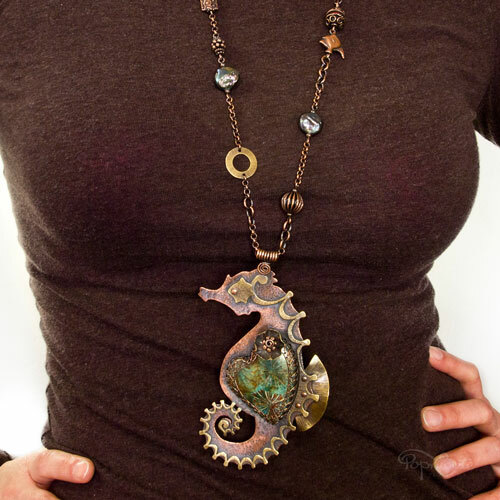 Custom made to empower your artful spirit. One of its kind. No two hearts are alike, every one of them has a unique story, just like your quirky personality. Scroll down to read the stories. 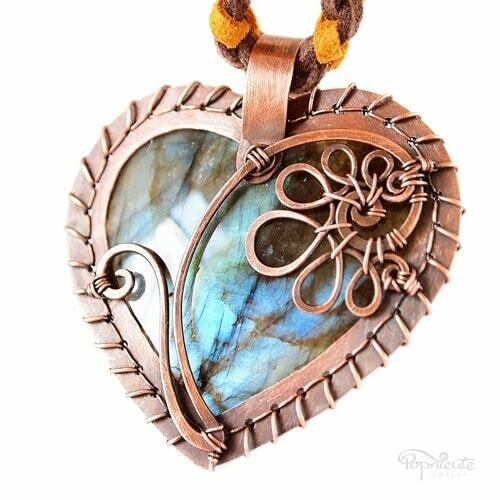 Whether it's a shiny labradorite or a beautiful agate, you will know when you see it! Each stone has its own unique traits, no two will look alike. 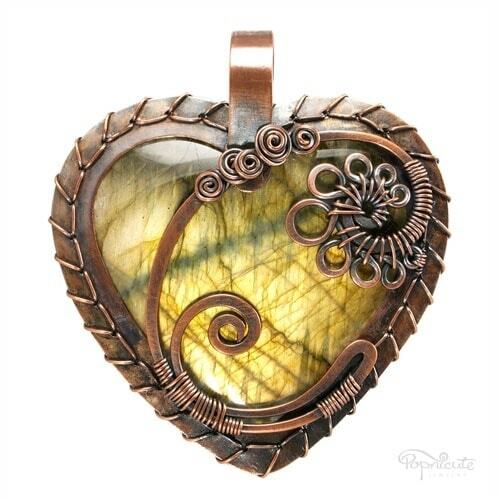 From Blissful Heart to Whimsical Heart there are many available designs to be customized with your choice of stone. Have a specific idea in your mind? Talk to me or scroll down to get inspired. After we finalize the design, I will start crafting your heart from scratch and show you some progress photos and maybe even a video! Are you ready to order one? You draw out another black top from your closet. Black is more than a color to you, it’s a lifestyle. As someone who owns a lot of black outfits, you want something colorful to capture attention. Something simple yet as commanding as your presence when you enter the room. 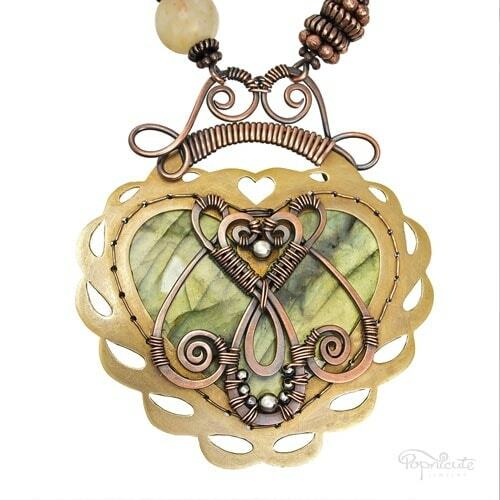 This premium Blissful Heart style is made for you. 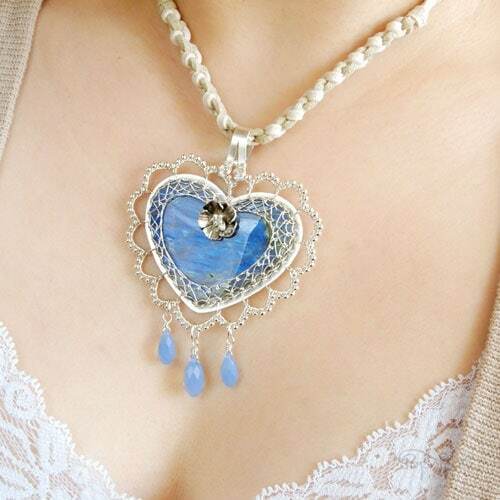 It has a simple frame around the heart and can be worn on either side, especially if you choose a heart stone that is domed on both sides. The design is clean, simple, yet blissfully attractive. It comes with a matching braided vegan suede lace, tie to fit. A chain can be requested for a custom quote. 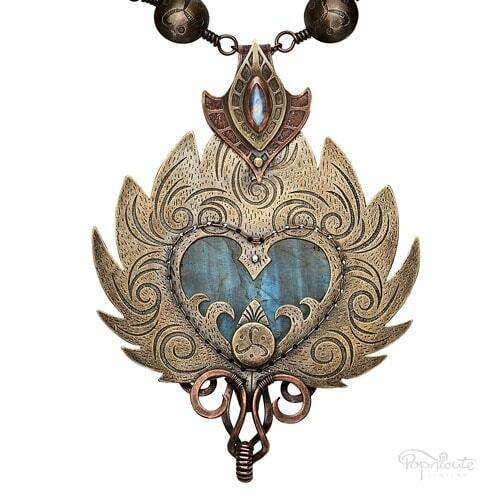 Drag the sliders left and right to see the custom made Blissful Heart pendants on the model. 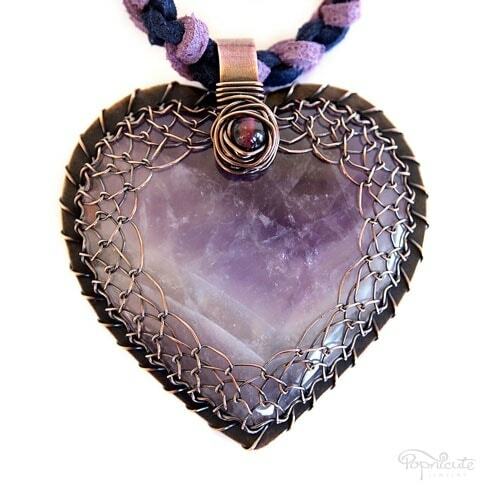 “Heart of Brenda” – Brenda fell in love with this amethyst heart and wanted a simple cage design for her heart pendant to show off the chevron pattern on the stone. 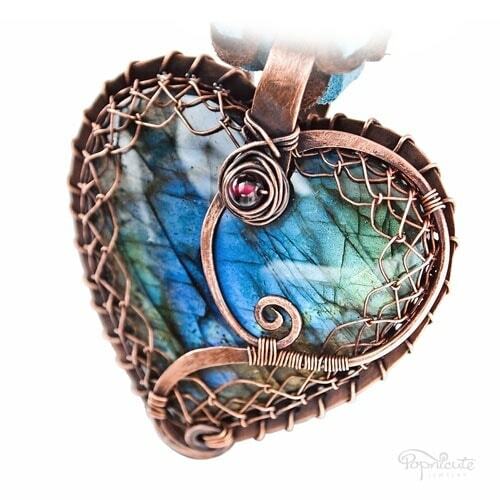 “Heart of Melissa” – A lopsided labradorite heart pendant custom made for the renown metalsmith Melissa Muir, USA. The poppy flower and the daintiness of this heart matched her sweet personality. 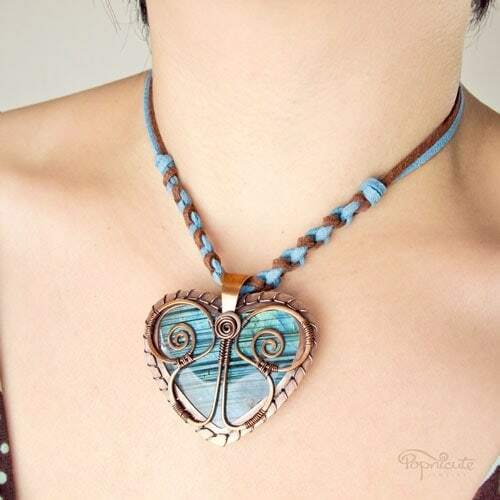 “Picasso Heart” – The first prototype (2010) of Popnicute Hearts collection. 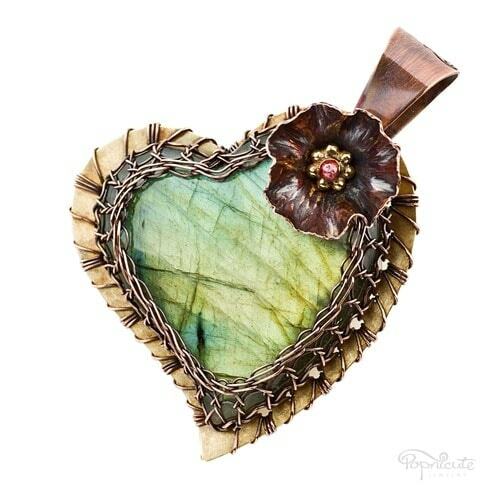 Picasso jasper heart stone. The one that started it all. 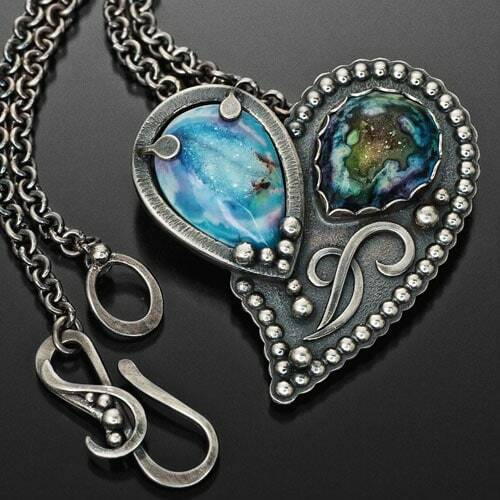 Named after you, these gleeful heart pendants can’t be anymore personal. 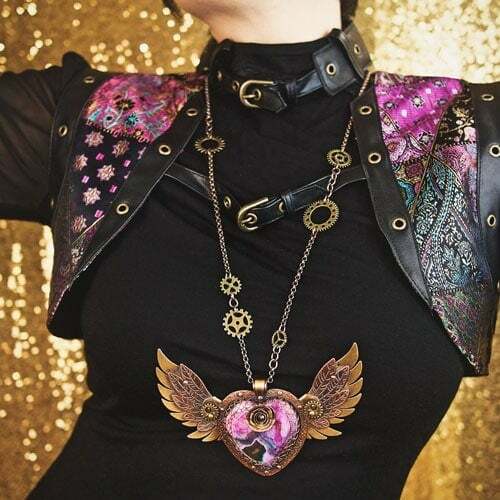 With the same attention to detail as the premium Blissful Heart style, the Blissful Heart Plus offer a little something extra. It could be an initial of yours OR a simple flourish scroll design, or a combination of both. When you choose it to be a reversible pendant, you can have a sweet wire design on the front and a personalized initial on the back. Wear it anyway you like! 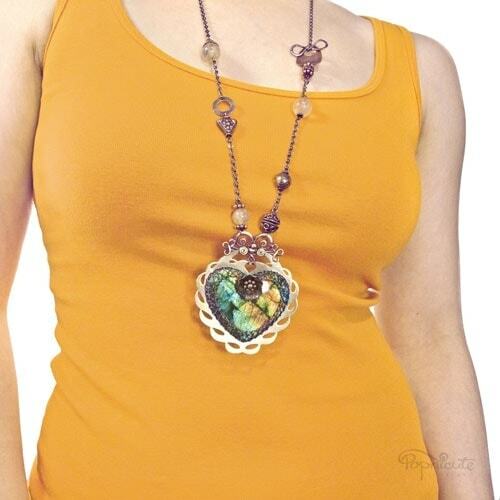 Drag the sliders left and right to see the other side of the personalized heart pendant or on the model. 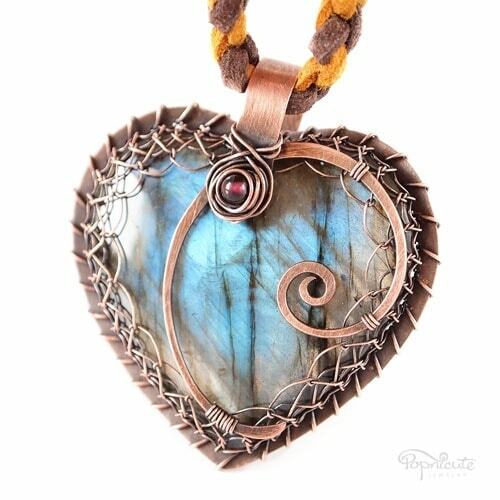 “Heart of Aarion” – A personalized heart pendant with an “A” and a butterfly on top of a gorgeous blue labradorite with striation patterns. 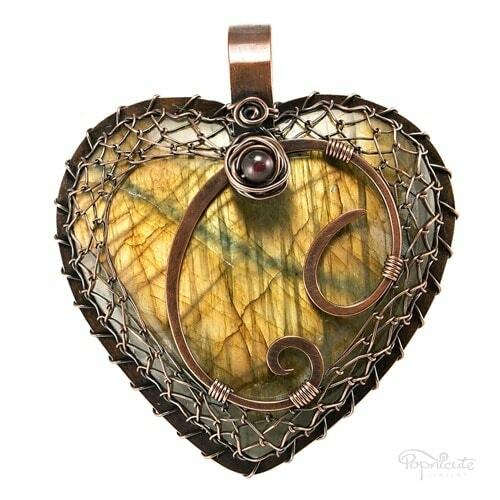 “Heart of Cien” – A flashy yellow labradorite heart pendant personalized on both sides with two decorative “C”s details for Cien Cien from Indonesia. 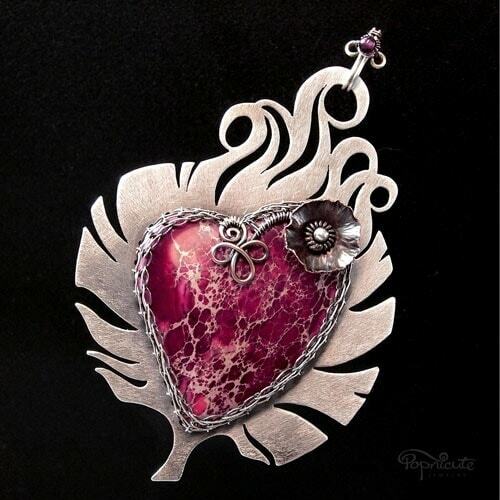 “Heart of Julia” – A unique “J” initial decorated the backside of this personalized pendant for Julia in USA. Ordered by a thoughtful friend of Julia as a gift. 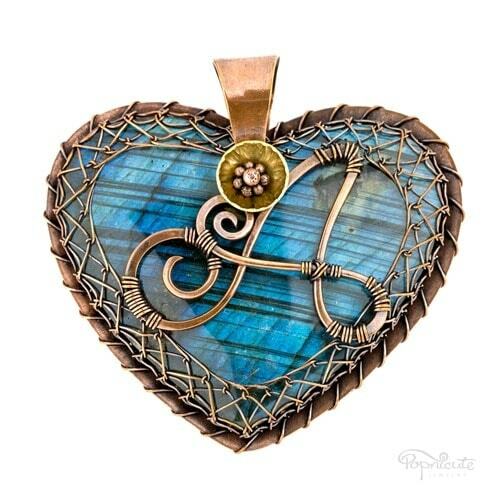 “Heart of Catherine” – A personalized reversible heart pendant with two “C” initials on top of a gorgeous blue labradorite. Her husband’s name is Steven and I made the other “C” to be a clever disguise of an “S”. 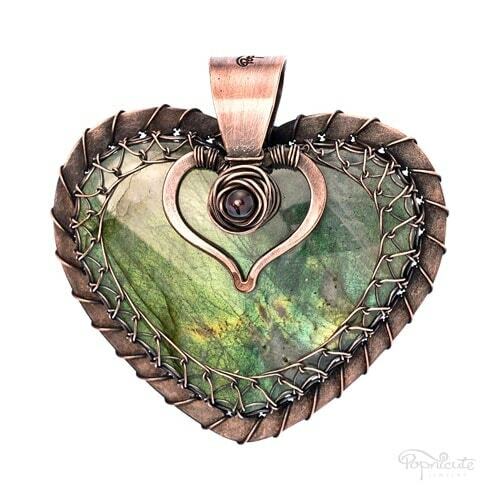 “Heart of Kelly” – A serene green labradorite heart custom made with a small wire heart detail for Kelly from USA. 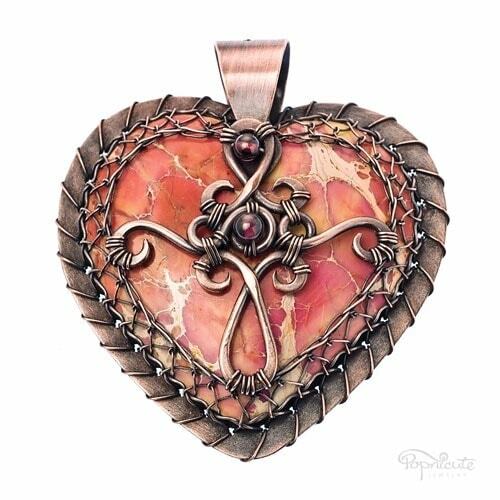 “Heart of Kelly 2.0” – A playful pink sea sediment jasper heart custom made for Kelly from USA with a cross design on the front. 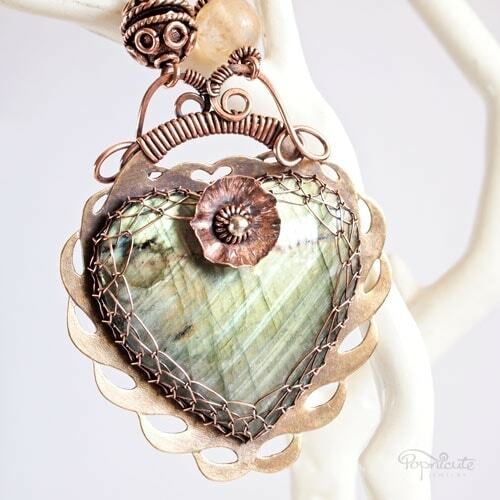 “Heart of Stella”. 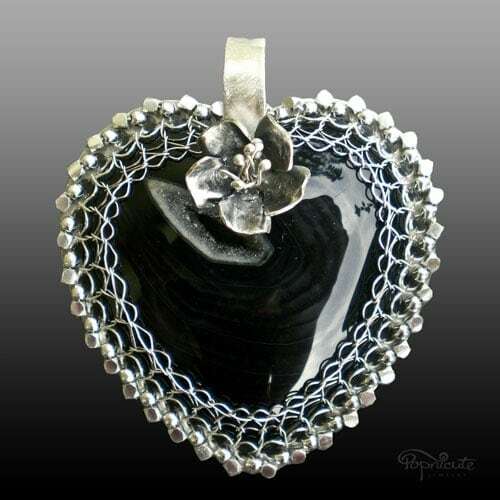 Custom made and personalized reversible heart pendant for Stella from Netherland. 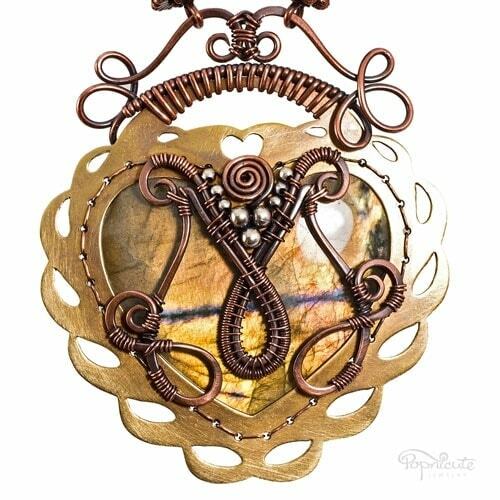 Stella opted for a couple of scroll designs instead of initials on her blue heart. You’re sensitive and empathetic. You may be a little indecisive but you always think with your heart. That’s what makes you special and a great friend to many. 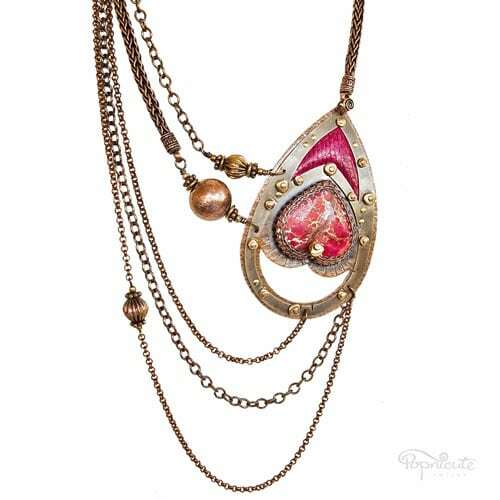 When you need to feel a little bit glamorous than usual, you reach for the Tender Heart necklace from Popnicute. Featuring an embellished, lacy frame, each heart is exclusively made for you. 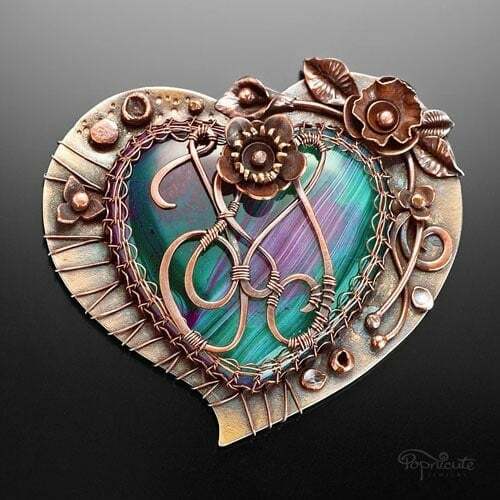 Wear your custom heart with pride! 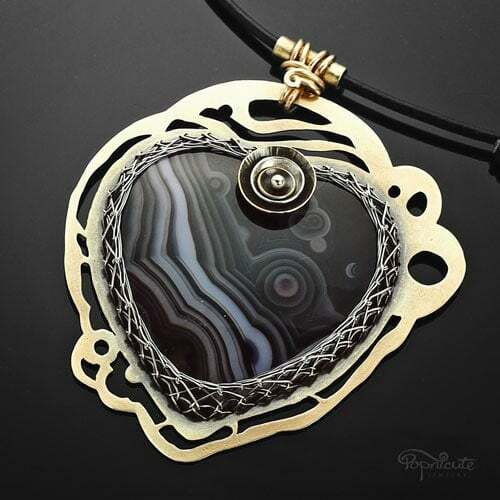 “Heart of Yukiko” – A black heart agate with a drusy pocket that mimics the shape of a leaf. It has a custom edging made in sterling silver and a sweet flower detail to compliment the leaf. 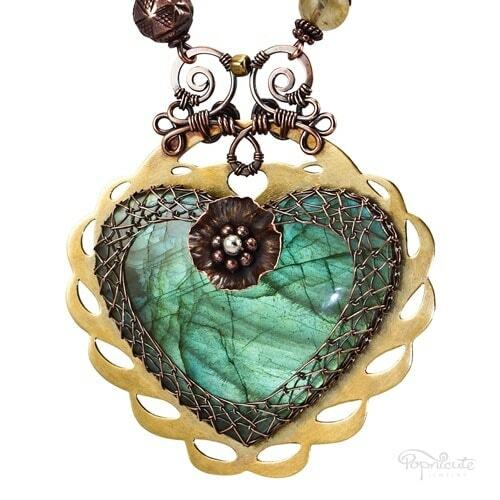 “Heart of Evi” – A unique malachite is the heart of this custom made pendant. The double-scalloped edging is a fun and romantic addition to personalize it. 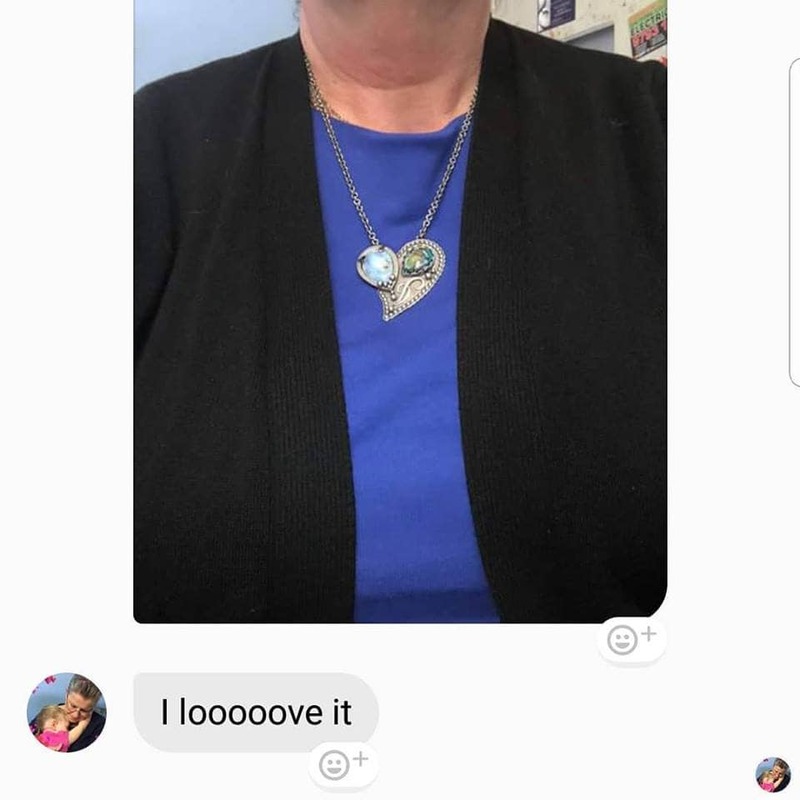 A special necklace for a special person in New Zealand. 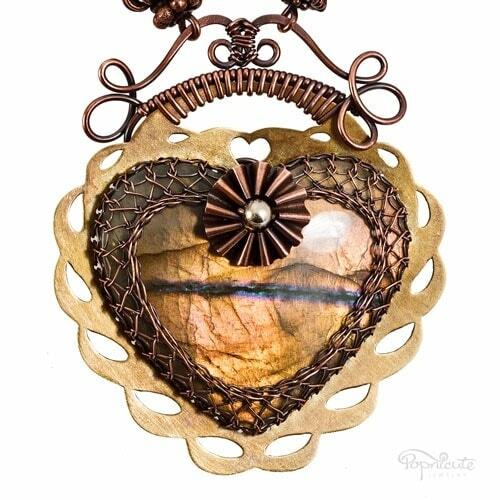 “Heart of Laura” – A romantic lacy heart pendant custom designed for Laura in Paraguay. She loved my wire scalloped design and let me gone wild with it. You’re so much in love you’re ready to shout it out loud to the world. Albeit in a reserved way that’s not too obvious but everyone that’s close to you would know what it means. Here’s when the Loving Heart comes in. The Lovely Heart pendant cradles a couple of initials, one for you, one for your loved one; side by side arranged in the most attractive, intertwined, and loving way. 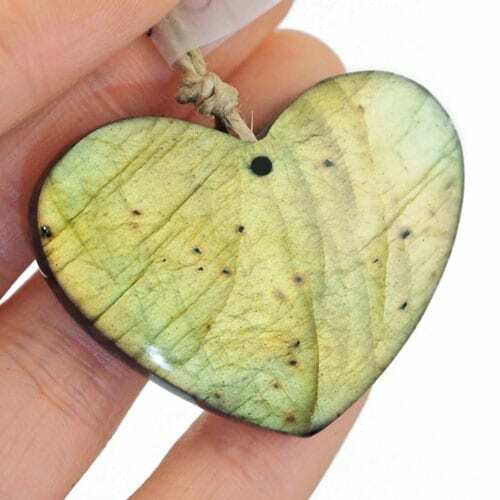 Drag the sliders left and right to see the other side of the custom made heart pendant or on the model. 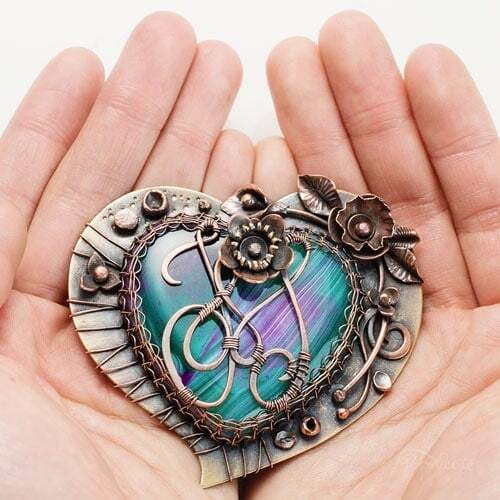 “Will You Marry Me?” – A custom designed proposal heart token. Mamush from USA proposed to his girlfriend, Joan, in the Philippines with this heart. She heartily said YES! <3 Don’t you love a happy ending?! I was in the Philippines for like 2 weeks and I proposed to my Joan. And yes yes she loved the heart :)!!! Thank you thank you so much cause I did get it right before the weekend I flew out to be with her and propose. 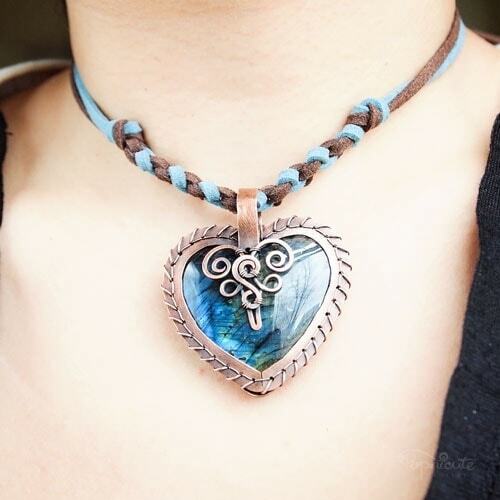 “Heart of Amanda” – Amanda wanted hers and her husband’s initial on the front side of her custom heart pendant and their 4 children’s birthstone on the chain. 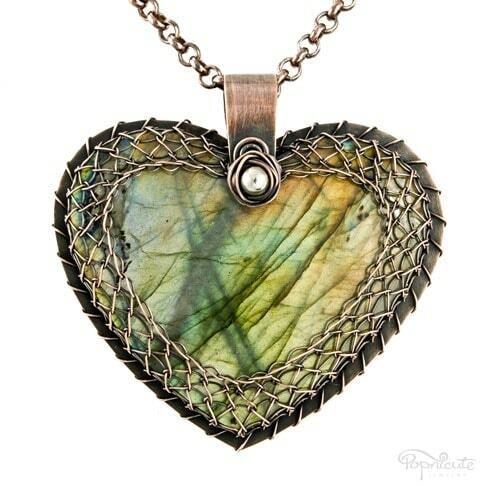 The colors that represented their birthstone couldn’t be more perfect for the heart focal! I guess they were meant to be. 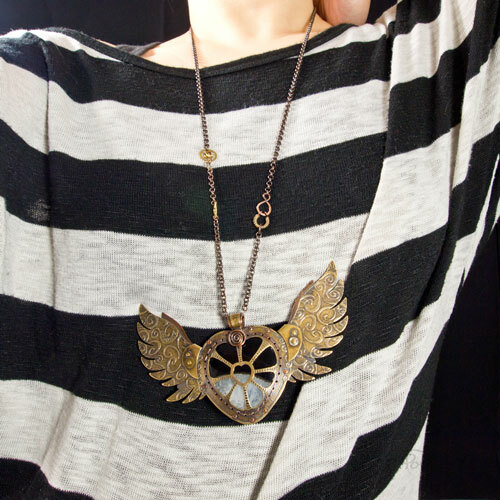 The first design was custom made and gifted to Drew Barrymore in 2012, hence the name: Heart of Drew. 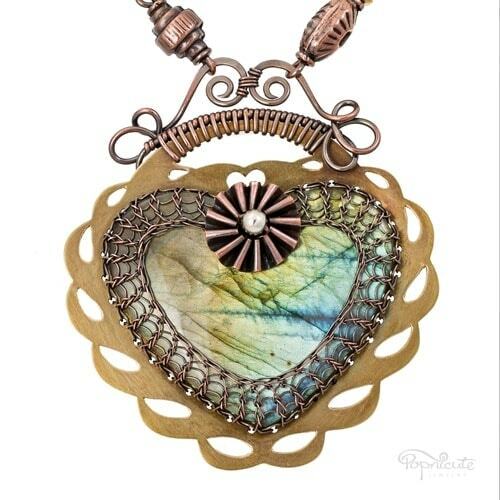 So many clients have trusted me to make variations of this heart design and personalized to their wishes. The custom made crown is dynamic and youthful. 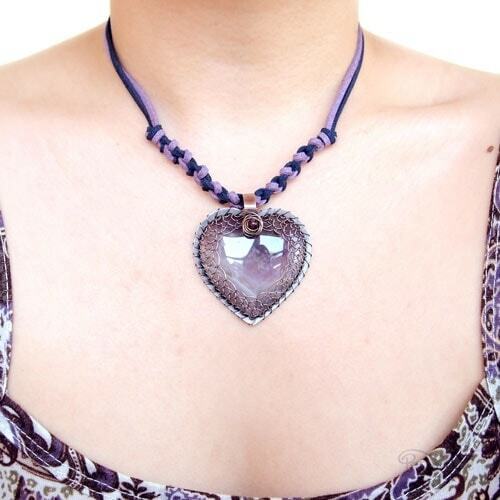 The beaded chain is unique and spunky. 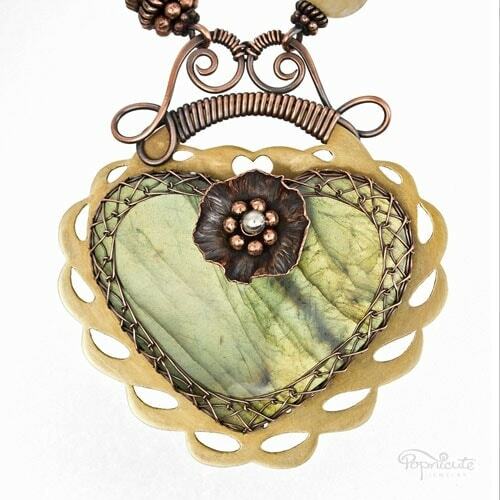 “Heart of Drew” – A custom designed heart necklace gifted to Drew Barrymore, the first of many of this design. Another one that started it all. 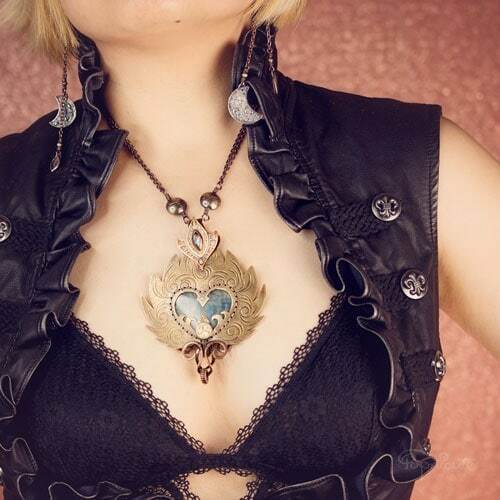 “Heart of Michi” – Michi was one of the early adopters of the Heart of Drew style and I made her a fancy “M” initial on the back of her custom made heart necklace. 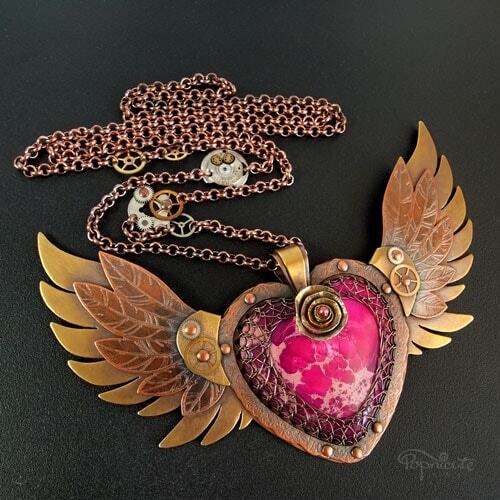 “Heart of Michi 2.0” – Michi thought she lost her first custom heart necklace that I made her so she ordered another one with her initial to replace it. She later found it and gifted this one to a dear friend with the same initial. 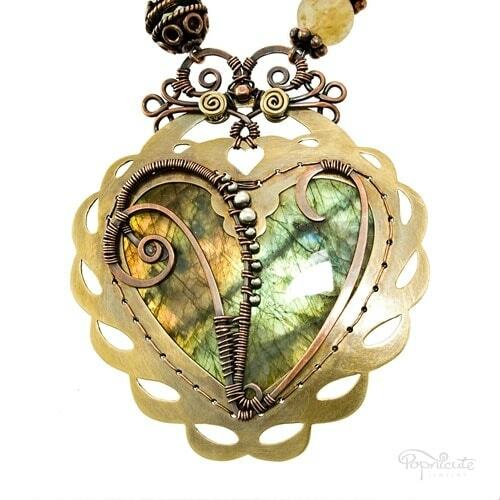 “Heart of Lina” – Custom ordered by Carl in Sweden for his sweetheart, Lina. Lina professed to have been wanting one for a long time now in her comment over on Facebook. I love my heart! I have been drooling over your jewelry for a long time now. Thanks to a very sweet guy I can enjoy this piece of art daily. I love how the heart just lights up when the sun hits it! I do recommend this! 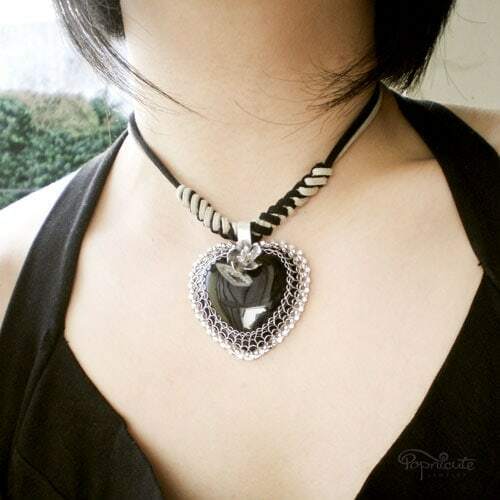 It's very well made and easy to wear! 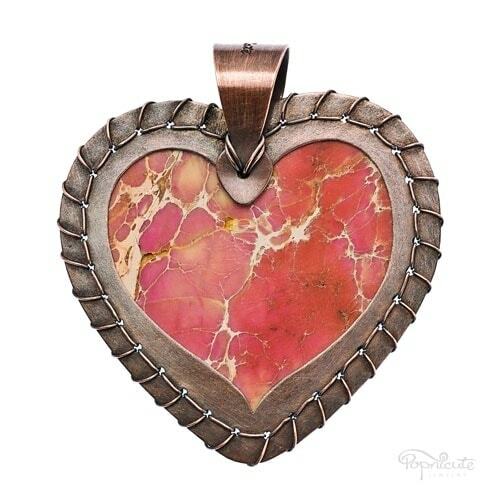 Thanks again for the Heart of Lina! 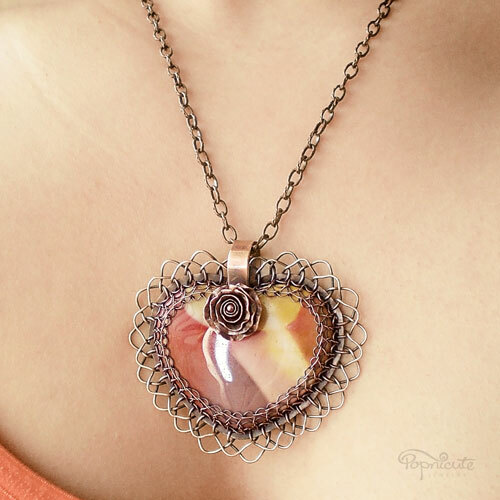 “Heart of Jasenka” – A custom designed heart necklace ordered as a gift to a dear aunt. Embellished with a script “J” on the back to personalize it. 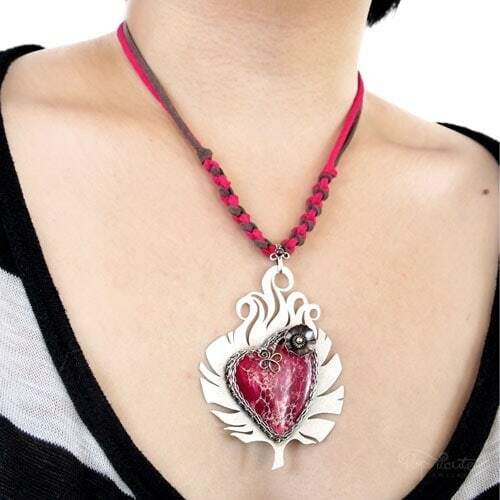 “Heart of Cyndi” – Modeled after the popular style Heart of Drew pendant, Cyndi was happy with her personalized heart necklace. Calling all anime lovers! 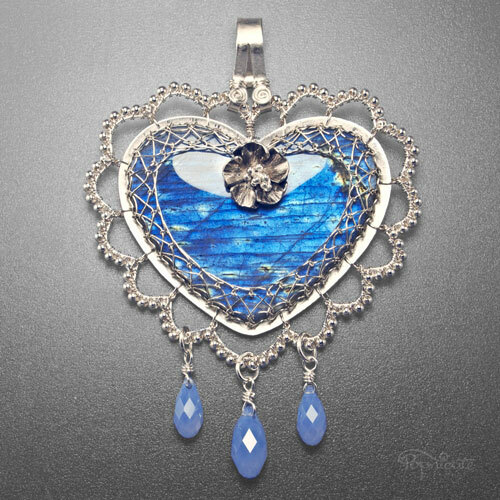 Many people have told me the shapes of these winged heart pendants reminded them of a certain Sailor 😉 I used to watch and read the heck of the shojo anime and manga when I was a teenager. Could you say, inspired? 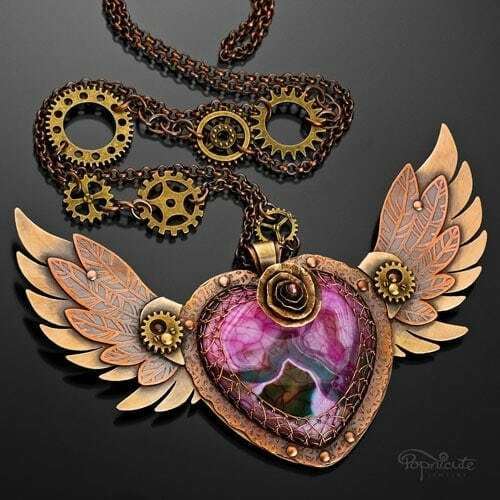 This winged heart pendant design looks a little bit Steampunk with the strategic addition of cogs and gears. 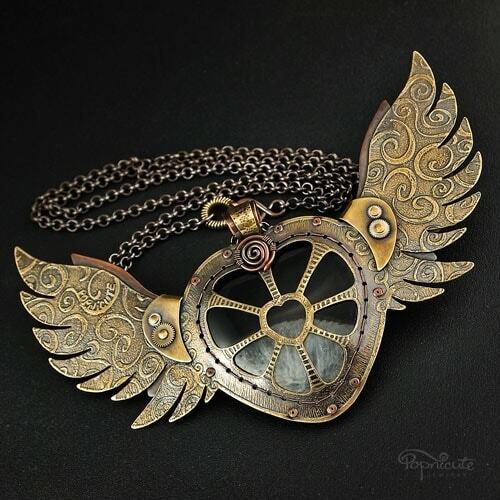 It’s a great necklace to accompany you to any Steampunk themed gatherings. All cold connection with a clever engineering. 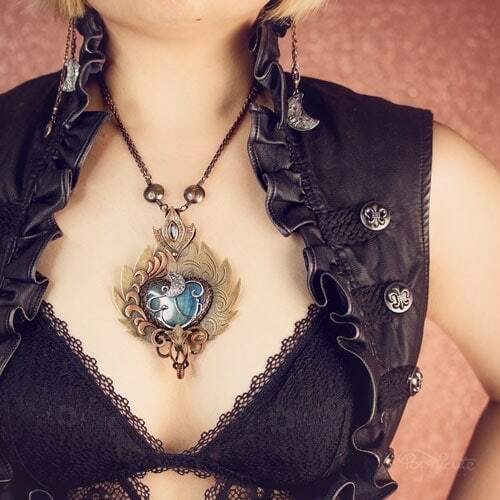 “Heart of Alexa” – A fancier, reversible heart with wings pendant custom made for another Japanese manga fan, Alexa from Indonesia. I think the caged heart look is totally rad. The feathers and swirls were all hand drawn by me. 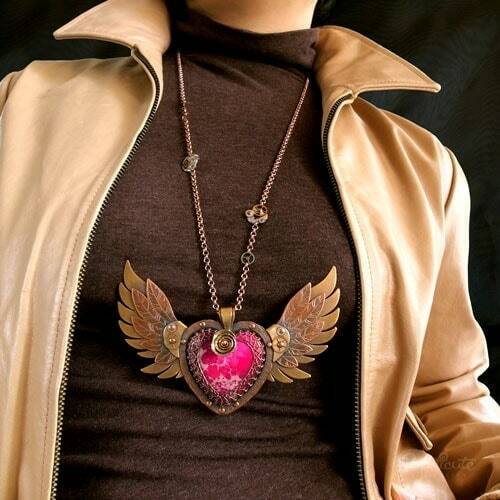 “Heart of Ling” – A custom designed heart pendant with wings for Ling, an anime fan from Singapore. She knew she wanted something big that is a heart with wings and I came up with this design for her. 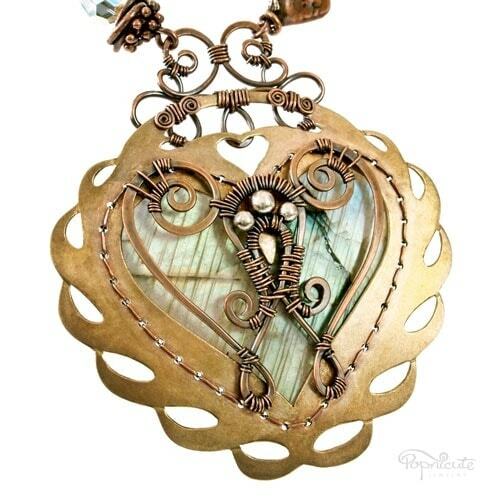 “Heart of Gabriella” – A colorful agate is the focal of this steampunk heart pendant. 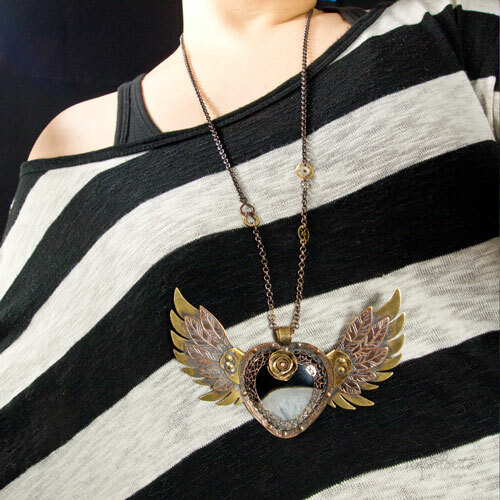 Gabriella from the Bahamas fell in love with the winged heart design when she saw it. Nothing is off-limits! I’m here to make your dream heart come true. 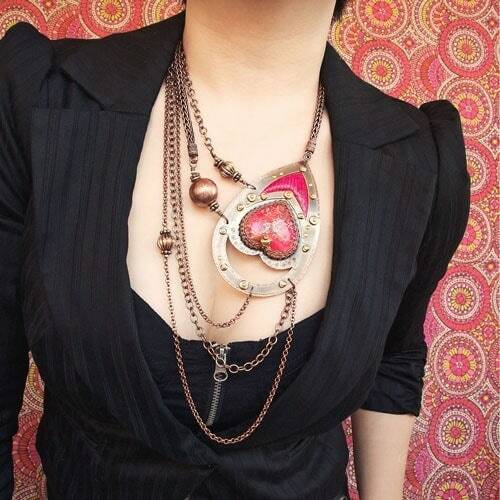 Let’s brainstorm and make a tantalizing design that fits your persona to a T. Whimsical designs, fun-filled heart pendants/necklaces. Your idea combined with my creative vision, together we can create something that’s truly one of a kind and awesome! Want something special for yourself? Let’s talk!! 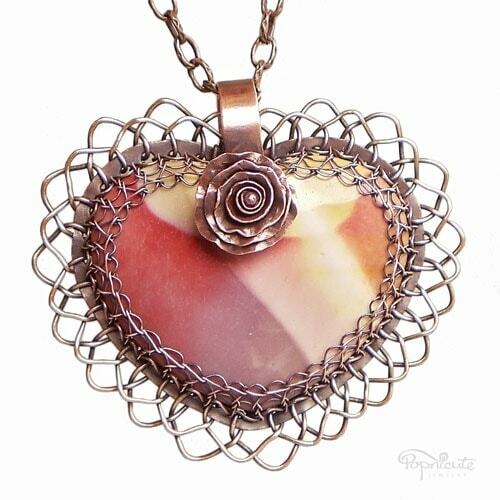 Move the sliders left and right to see the other side of the personalized heart pendant or on the model. 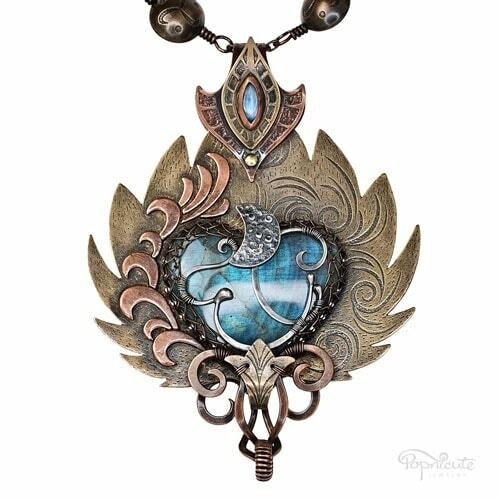 “Heart of Eila” – As a true fan of the game League of Legends, Eila wanted a custom heart necklace inspired by the game character Nami. I also designed a matching pair of earrings to go with it. 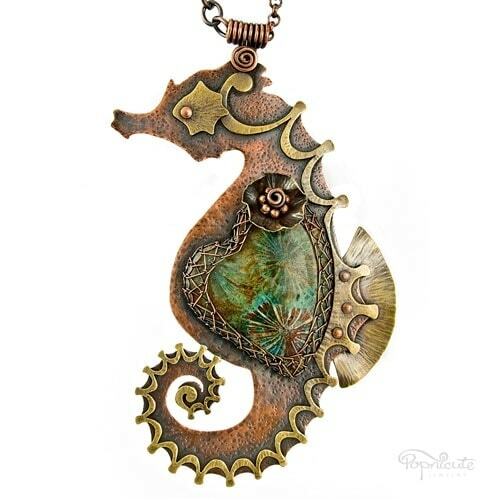 “Heart of Emily a.k.a Seahorsie” – A whimsical seahorse designed for Emily. 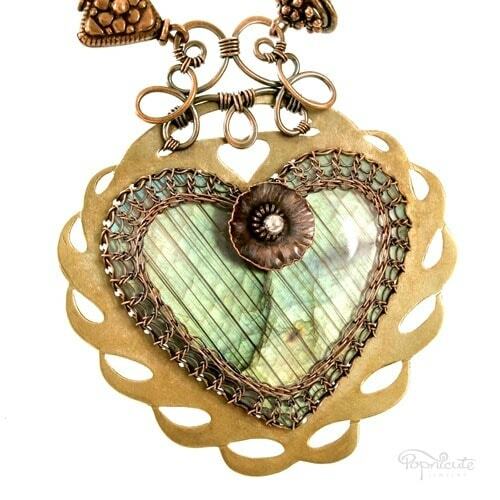 She chose a fossil coral heart stone that couldn’t be more perfect for this sea themed heart necklace! 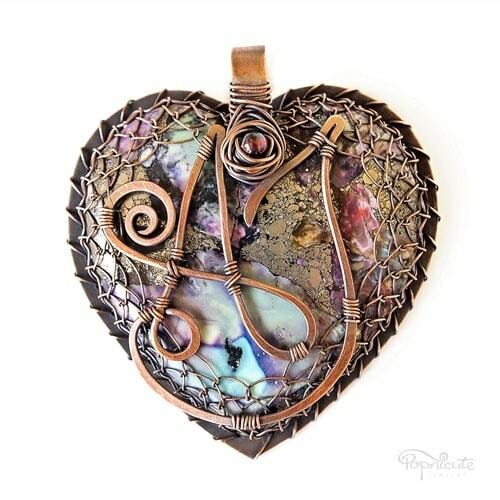 “Heart of Lucy” – Not a heart stone but a heart nonetheless. 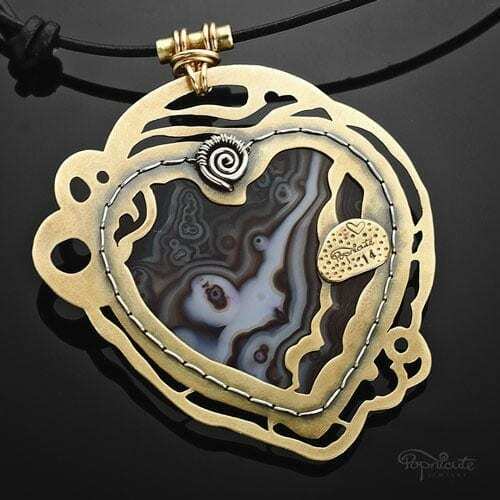 Custom made for Lucy from Australia, this custom sterling silver heart pendant features a couple of teardrop drusy agates. 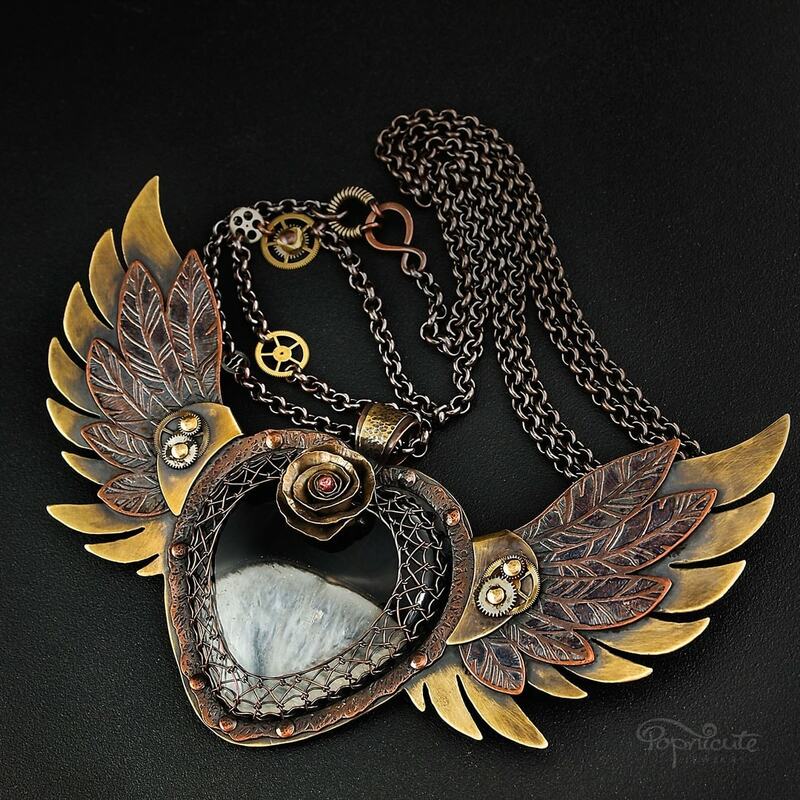 “Rockstar Heart” – Made with Lucy Hale’s character in Pretty Little Liars in mind, this piece was sent to ABC Family studio for consideration to appear on their hit TV show. 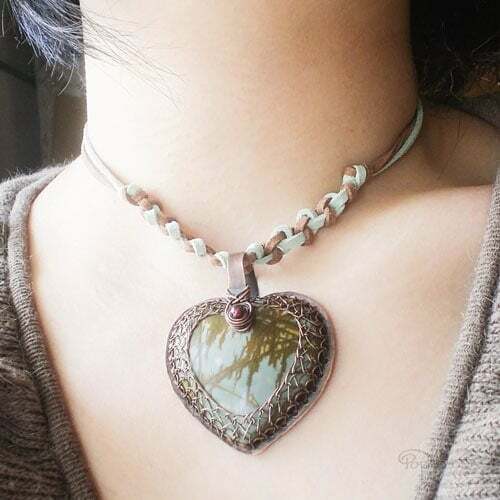 “Heart of Christiana” – Chrissy from Cyprus loved feathers and she asked for her custom heart pendant frame to be made into a feather with a skinnier border wrap to show more of the stone. 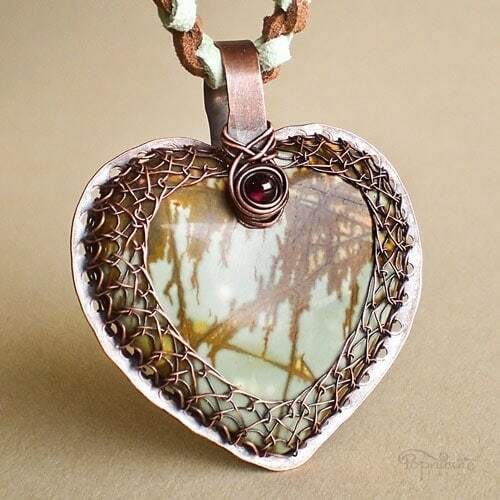 “Heart of Sarah” – Sarah chose a really cool banded agate for her custom heart pendant. 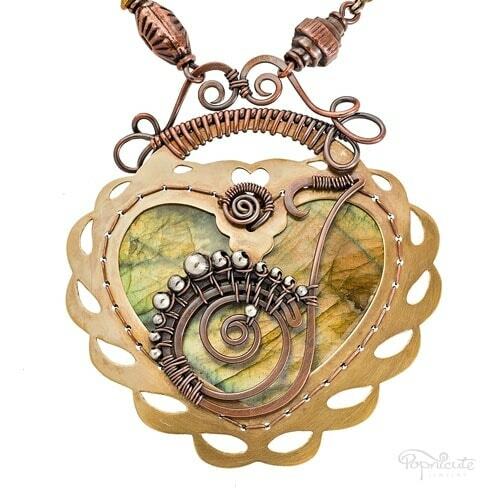 I designed a frame to mimic the organic lines on the polished agate center. 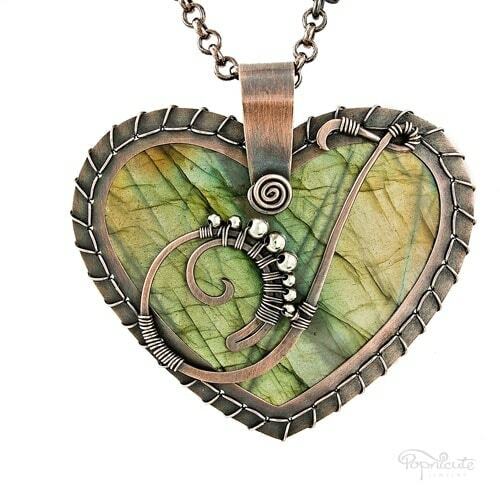 Have you set your heart on a stone pendant yet?